Q. How to check the HENNGE One operational status and/or defect information? A. You can check the information on the HENNGE One status dashboard. In addition to this, you can receive the information via email and/or SMS if you register your email address and/or phone number. １.Click on "SUBSCRIBE TO UPDATES". 2.Register your email address/phone number. 2-1．Enter your email address and click on "SUBSCRIBE VIA EMAIL". 2-2．An email will be delivered to your registered email address from noreply@statuspage.io. Click on the URL mentioned in the email to activate the subscription. 2-1．Enter your phone number and click on "SUBSCRIBE VIA SMS". 1-1．Click on the "unsubscribe" link at the bottom of distributed emails. 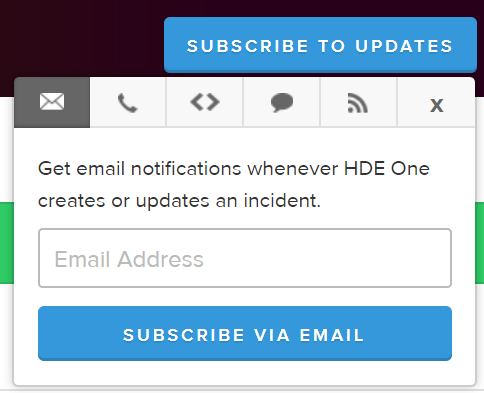 * Notification emails are distributed from "noreply@statuspage.io". 1-2.Click on the "UNSUBSCRIBE FROM UPDATES". 1-1. Click on the "To unsubscribe go to" link in the message received when you registered your phone number. 1-2. Click on "UNSUBSCRIBE FROM UPDATES". 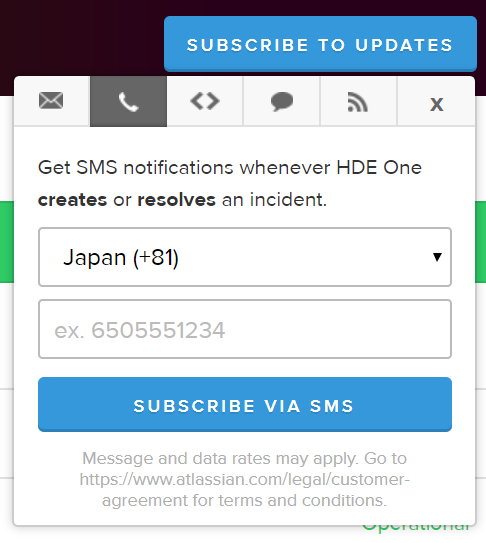 *In cases where you cannot find the message received when you registered your phone number or you have any trouble with the cancellation of SMS subscription process, please feel free to contact Customer Success Guide. We are happy to deal with the matter instead. (in cases where an issue is detected, updated and resolved), an email will be distributed. where an issue is detected and resolved. *Note2：We renewed the URL of the status dashboard on May 16th 2018. If you use the old status dashboard through your bookmark, please update the URL. registered by the above"SUBSCRIBE TO UPDATES" steps.